Thank you for stopping in. Chances are, your web search landed you here because someone either loaned you one of our books or so enthusiastically shared one of our books you would like to purchase your own (because they refuse to part with theirs). Or, you are searching for how to better understand yourself, learn what is holding you back, finally solve the mystery of what you would like to do with your life or in the midst of another cycle of reinventing yourself to find the career you were meant to fulfill. You might be a learning and development professional, educator, a life coach or DISC facilitator seeking literature to inspire your audience or to more strongly support your objectives and increase your audiences’ understanding of how to be an effective communicator or more aptly define that which they would like to do in their life. Well, you’ve come to the right place! Our books, have reached audiences globally helping people understand themselves, understand others, become more effective communicators and discover their passion in life with the new found confidence to orchestrate their own reinvention personally and/or professionally. Quite some time ago, author, Arnie Warren asked Burger King founder, Jim Mclamore what is the secret to success? Mr. McLamore said, “Total belief in yourself!” My father responded, “But wait! How can you believe in yourself if you don’t know who you are?” A rather deep question, but yet, so exceedingly true. Arnie’s first book, “The Great Connection,” is a profound first step in understanding who you are and why you do the things you do! AND why others behave the way they do! “The Great Connection” is a part auto-biographical story whose characters reflect one of the four DISC behavioral styles. As you read, you will see yourself, others in your life and finally begin to understand who you are, as well as others. Learning and development facilitators and life coaches have found this book to be a great resource to solidify a participant’s understanding and strengthen their confidence to know thy self and to become a more impactful communicator. 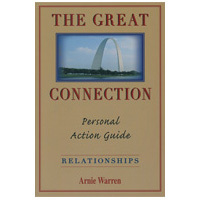 The “The Great Connection” companion book, “The Great Connection Personal Action Guide, Relationships,” gives you the opportunity to further explore the behavioral tendencies, along with acknowledging your fears and where you are within the DISC framework. Engaging in activities that help you to best understand your self, your obstacles, your fears and other elements that tend to hold you back actually make room for you to focus on what your natural talents “gifts” are and where in the professional world they live in job form. This is where one can really learn what their passion is in life! 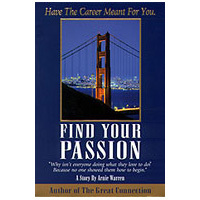 Arnie’s book, “Find Your Passion,” will take you on a researched journey illuminating you to your own reflection of natural talents and gifts that will assist you to either finally connect with your passion, or reinventing yourself discovering a different passion you are ready to pursue. Can you have more than one passion? Arnie is proof, and like each of us, we have the unknowing unrealized ability to reinvent ourselves in a forward manner garnering happiness with our work; our life. The art of reinvention evolves as you do, every step of the way!